I love HOMEMADE Food be it snacks, Staple Foods or Bread. I try my hands on any new FOOD I found out as long as the ingredients are available in my country of origin. There was a period in Nigeria that cost of cosumable goods where high both raw materials and its end products, due to RECESSION. I was buying BREAD at a high cost all because flour price was inflated. And my family’s bread consumption was at an alarming rate which was making me spend hugely on bread every week-days. So one good day I sat down and say to myself I was going to try my hands on making HOMEMADE BREAD, I have a mixer and gas oven including bread pan that I was using in baking cake. So I went online and searched for bread recipes, I got so many and that was how my HOMEMADE BREAD journey began. My first bread wasn’t bad but it was not the perfect bread as well, second came, third and not till the fourth attempt that I got it right. Soft not too stretchy and nice tasty bread. So I took a picture of it and shared it on Nairaland Forum where I visit for others who were going through the hard RECESSION that we were faced with at that period. 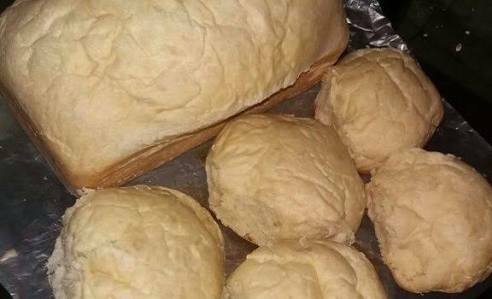 Here is the bread recipe for anyone who might be interested in making HOMEMADE [DIY] BREAD. 1 tbsp low fat margarine or butter.. If you have a mixer and it has bread hook, then, Shift your flour in the mixing bowl, add your sugar, salt, yeast, milk and butter. Mix with hand, make a well in the flour and pour in your water, oil and add any flavour of your choice if you want max half teaspoon. Mix by hand or with a spatula. When it’s folded attach your bread hook to your mixer and start kneading it for 8 -10 mins. Bring your bowl out and cover very well for 1 and half hours. Take back to knead again for 3-5 mins more. Flour a suface or kneading wood and knead by hand to make sure it’s not sticky then roll like a ball and spread it long to fit into your already greased pan. Place the dough in the pan and cover for 45 mins to 1hour. Then bake in a preaheated oven in medium heat for 30- 35 mins or until the bread is done. You can do egg wash before baking or after baking you melt little butter and run on top of the bread and allow to cool. Your bread won’t go stale for atleast 3-4 days if you put in the fridge. But if you want to keep for a week to weeks then you can add rum or powderd preservatives. NB. Please the water should be room temperature. If you are using hand, then knead it for 10-12 mins and knead for 5 mins the second time on floured surface. ☆If you try the RECIPE, can you kindly use the comment box to let me know? These would be perfect with homemade soup or burgers.